I can't find a new thread, so hopefully another one hasn't been started! 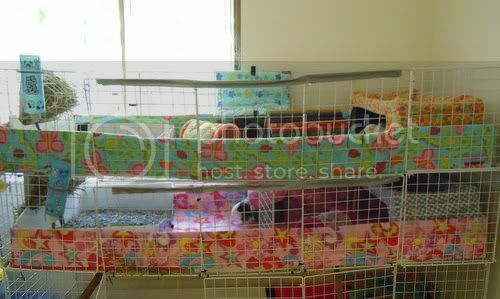 Our bedspreads from piggybedspreads arrived, so I have some new pictures of the cage. I love your cage fleece. Nice and bright and so girly!! I love your new fleece. They are so colorful! Thanks for starting the new thread. I've been waiting for this thread! Here's my new cage. It will probably be a final one. New hay racks. I'm trying all fleece in the cage. These racks are accessible on both sides and have a coro tray underneath to catch hay bits. I still have to install a better bottle holder. The bottles are attached to the grids for now. Wow, that's pretty cool. Is the cage a custom build, or a converted something? Edit to add: I built it from scratch. Went to the lumber yard and have them cut the wood for me. 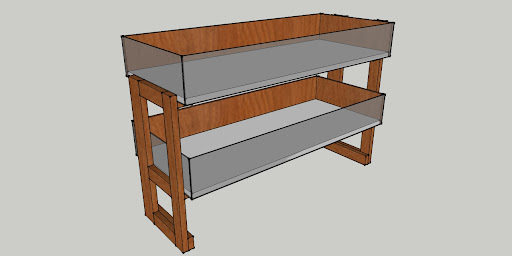 This is a 3D version of the cage. I decided to paint it white after finished building it. and yes... the legs are not completely painted. The cage was too heavy for me to lift and put a plastic tarp under it. 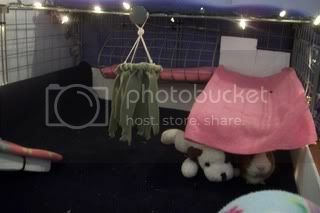 I ran out of pink fleece when it was being washed here, but just another toy set up. Brown fleece was from a passed away males cage. 2 sows in this cage, its an 11x4. Looks fab, lissie! You have great taste! GPG, you have a nice cage. You should post more pictures of it! Char-x, I've always admired your cage. It looks great and so spacious. I wish I have that much room! Very nice cages. That 4 x 11 is a whopper! I'm sure the piggies love it. 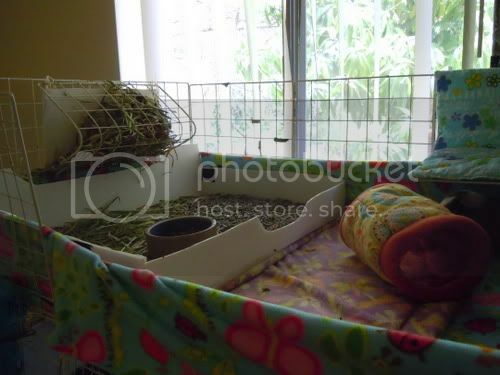 Lissie, your cage looks so nice and neat. Oh, yes, yes, I must share my cage as well. Perhaps if the weather is nice tomorrow (I'm a tad obsessive with natural lighting, ha) I will take some shots! I love the cages!! I'm JEALOUS!! Wow my cage could never come close to these! The loft with their hay rack, food and water. 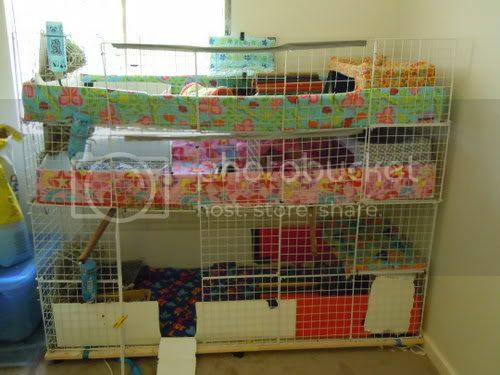 Woah I must say I'm incredibly jealous of these amazing cages. Mine is a pretty standard 2x4, I want to expand some day when I'm no longer living with my dad. I just don't have much room in my bedroom. I want to add a loft pretty badly. 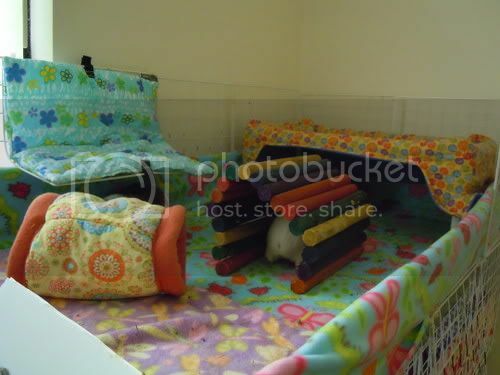 I just checked the guineapigcages.com site to find ways to make a ramp and in the store they will actually make one for you for a price. This pleases me greatly. Okay, enough rambling. Here's my cage. 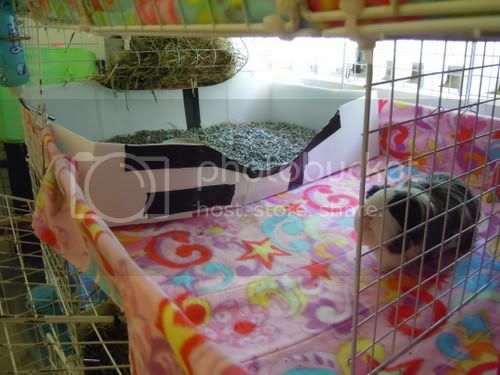 I put an old fleece blanket on one side of the cage because it gets really cold at night. 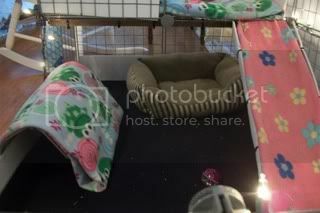 There's some cuddle cups and some extra fleece to burrow in underneath it. The girls love it. And I just wanna say how much I've grown to hate pigloos. I really want to get rid of them. 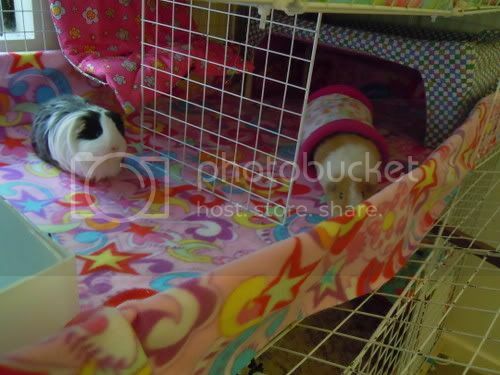 I hope my cage will be as beautiful as these when I get some piggies! Get rid of them! I've never had one and my pigs are fine. You can make other hiding spots. I can't let them go totally free range; we have cats!